Summary: As part of Ziflow’s goal of being the go-to choice for all your review and approval needs we now offer Rich Media (HTML5) support. 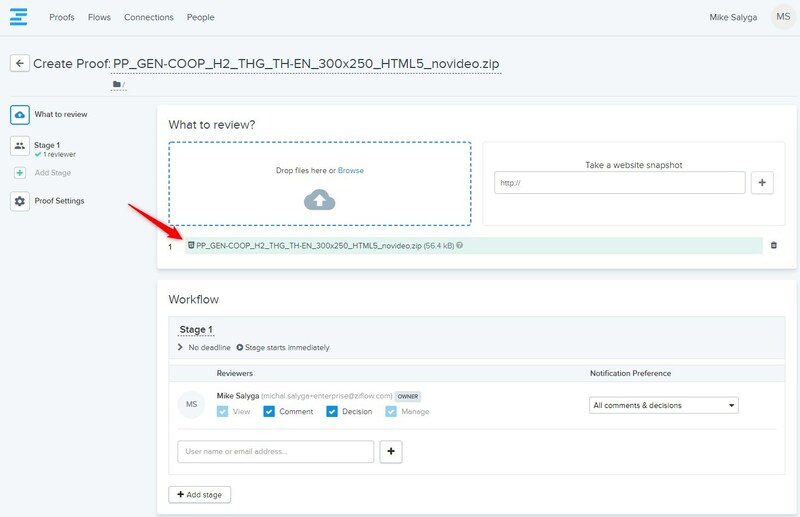 If part of your marketing efforts include HTML5 banner ads, websites and other rich media content, you can now review those in Ziflow using the same markup and commenting tools that your reviewers are already familiar with, as well as some additional tools that make proofing rich media easy. Where is the feature applied? Inside the Proof Viewer. The Rich Media Proof Viewer is designed to look and feel exactly the same as the standard Proof Viewer. Pause/Play - allows to you to pause animation so you can add a markup/comment to that exact moment. Refresh - lets you play whole animation from the beginning. The only difference between static/video and rich media proofs is that each time someone starts drawing a markup, Ziflow will take a snapshot of the banner/site. Once the comment with markup is saved, other reviewers will be able to see the snapshot. If a reviewer stops drawing a markup or closes an open comment, the file resumes it’s animation. Rich Media proofs can only be created by uploading ZIP file. You cannot combine multiple Rich Media files into one proof. Viewing Rich Media files requires installing Ziflow browser extension to your Chrome/Firefox browser (only those two browsers support viewing Rich Media files in the Proof Viewer). When trying to open HTML5 in the Proof Viewer for the first time, Ziflow will ask you to install the extension. Extension installation is pretty quick and simple but if you encounter any problems or you simply have some questions about it, just contact our support team. In order to review and approve Rich Media proofs, reviewers must disable Adblock and they cannot be working in incognito mode. Rich Media proofs do not have thumbnails in the proof list or on the proof details screen. Instead of a thumbnail we insert the HTML5 icon symbolizing Rich Media proof.